'S e prìomh-bhaile na roinne Guaviare, Coloimbia, a th'ann San José del Guaviare. Tha e suidhichte air an àirde an ear-dheas na dùthcha faisg air na coilltean-uisge anns an Amazon. Tha àirde meadhanach dhe 175m os cionn ìre na mara aige. 'S e baile le gnàth-shìde theth a th' ann le teodhachd mu 25˚ thar cheann, rè na bliadhna. Cha deach am baile a stèidheachadh ach ann an 1938. Mar a b'àbhaist ann an Aimearaga, chaidh ainmean-àite a chruthachadh le freumhan anns na creideamhan nan Spàinnteach: m.e. Sante Fe de Bogotá, San Bonifacio de Ibagué agus Santiago de Cali. Mar sin, fhuair am baile an t-ainm aige oir chaidh e a steidheachadh air an latha aig Naomh Seosaiph, neo José ann an Spàinntis. Tha am baile suidhichte faisg air an drochaid Nowen air an abhainn Guaviare. Ged a tha 53,994 nan tàmh anns a' bhaile, chan eil ach 19,131 a' fuireach anns na sgìrean dùthchasail am broinn crìochan a' bhaile. Tha fearrann na dùthcha sin ga roinn eadar na bailtean (Spàinntis: municipios) agus le sin tha gach clachan agus croit fo stiùireadh baile air choireigin. Air adhbharan trioblaidean poiliteagach air an dùthaich, tha a' mhòr-chuid dhe na daoine anns gach uile baile a-nis a' fuireach anns na bailtean fhèin, is na daoine a' fàgail na sgìrean dùthchasail. Taobh chinnidh, ' s e daoine geala/mestizos a th'ann a' mhòr-chuid dhe na daoine ann an San José del Guaviare. ‘S e Tùsanaich a th’ann an 1.7% agus tha 5.4% dhe daoine le freumhan ann an Afraga. ' S urrainn dhan 82.9% dhe na daoine ann an San José del Guaviare leughadh agus sgrìobhadh. A tuilleadh air sin, tha fòn aig an taigh aig 21.3% dhe na dachannan. Thathar a’ cumail am iomadach seòrsa dhe fhèis ann an San José del Guaviare. Chithear fèilltean caitligeach, leis gur e dùthaich le mòr-chuid chaitligeach a th’ann fhathast, fèisean na stàite agus tachartasan ionadail a sheallas cho làidir ‘s a tha beairteas cultarail na dùthcha. 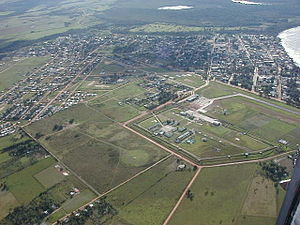 Air a tharraing à "https://gd.wikipedia.org/w/index.php?title=San_José_del_Guaviare&oldid=516719"
Chaidh an duilleag seo a dheasachadh 31 dhen Chèitean 2016 aig 08:57 turas mu dheireadh.